Posted on November 22, 2016 at 3:49 pm. 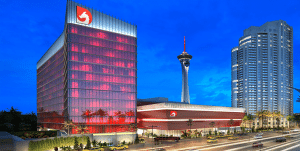 The Lucky Dragon Hotel & Casino has opened its doors for the first time, making it the first brand new casino to be built from the ground up on the Las Vegas Strip since the opening of the Cosmopolitan Hotel & Casino six years ago. After five years in the making, The Lucky Dragon’s soft opening was held on November 19th to invited guests, with the official grand opening scheduled to take place on December 3rd 2016. The Lucky Dragon is a boutique hotel and casino following an Asian-inspired theme, designed to be the first casino in Las Vegas to cater specifically to the Asian market. 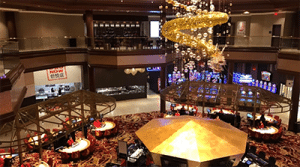 Along with a 15 foot, 1.25 tonne glass dragon sculpture adorning the centre of the casino, The Lucky Dragon has been seamlessly designed to follow a Feng Shui layout, from the colours of the carpets to the locations of the chairs. Staying loyal to Chinese superstitions, there will be no fourth floor in the hotel or the mention of the number four anywhere around the property, as the number four is deemed unlucky in Chinese culture. Front of House employees at The Lucky Dragon will speak Mandarin, Cantonese and other Asian languages, while all signage will be in Chinese first and English second. Located on West Sahara Avenue on the northern end of the Strip between the Allure high-rise apartment towers and the Golden Steer restaurant, the complex spreads over two and a half acres of land. The casino itself is fairly modest in in size compared to other Vegas casino giants like Wynn/Encore and Mandalay Bay, standing at just 27,500 square feet. The casino’s main focus will be on the table games popular in Asia, including baccarat and Pai Gow, although there will be a small selection of blackjack tables and hundreds of pokie machines available. The gaming floor will centre around an elegant pagoda shaped bar, which is where you’ll find the spectacular glass dragon sculpture. The main casino floor will also offer a high limit gaming area known as the Emerald Room, while the second level caters exclusively to VIP guests, providing an ultra-luxurious gaming floor. The dining options will all cater specifically to the Chinese palate, offering five restaurants including Dragons Alley – a dimly lit food court designed to replicate an Asian night market. Pearl Ocean will offer authentic dim-sum and exquisite delicacies, while the Cha Garden offers an indoor and outdoor tea garden and lounge area led by the only tea sommelier in Nevada. The hope is to attract international Asian clientele as well as domestic Asian customers from around Las Vegas and Southern California, while also tapping into the Asian market in Canada. Given the number of Asian tourists flocking to Las Vegas each year, it’s hard to believe the Lucky Dragon will be the first hotel and casino catering specifically to the Asian market. Thanks to its niche focus, we are convinced the Lucky Dragon will successfully revive a part of the Vegas strip that was largely effected by the global financial crisis. As noted by the Las Vegas Weekly, Lucky Dragon “might be the most specifically focused casino project in the history of Las Vegas,” and this is where it’s sure to succeed. By offering a smaller resort that narrows its focus down to a specific part of the market rather than trying to offer something for everyone, Lucky Dragon is sure to appeal to Asian customers as well as other tourists looking for an authentic Asian casino and hotel experience. If you get sick of baccarat and Pai Gow, a plethora of table games can be found at casinos further down the strip.